This morning my husband's cat decided that I should be awake around four. I get up for work at five but he was sure that I needed to be awake and petting him for four. When I kept dragging him off of me he made a secondary decision to lay on my pillow and shed in my face while drooling on me. At fifteen he has no teeth so the foul kitty drool is a pretty horrific thing. This means that I was out of the bed before my alarms went off to escape the rather intense and determined affection. I blame my wandering state of mind on this. I often read twitter while I am stumbling around the house in the mornings. You may suggest that not reading my phone would help but I can assure you that it clears my mind faster. So, there I am dressing and reading in between garments because its to early in the morning and socks are hard and I found myself in a cascade of thoughts that brought me thinking about someone who is currently unsubbed. They are not bitter unsubbed. They are just busy at the moment. However, they unsubbed shortly after they achieved a major goal in the game which is to get into a particular corporation and improve their PvP skills. And I thought about that fact. Was it ironic that they had reached personal goals only to ubsub after? But, realization stuck its head into the situation. This was not the first time that had happened to someone I knew nor was it the second. In fact, I had noticed an odd pattern a while before and this particular thing fit into it. Player retention is a major focus of the game. There are theories about why people play and why they do not play. Eve has sticky aspects to the game and once stuck many players have a hard time freeing themselves. That's intentional. After all, players are income. But, we still come and go from the game. Some breaks are shorter than others. Some longer. Some never return. But, the oddest pattern I've seen is people leaving after they achieve a goal that they have worked for. I'm reminded of the player that works to join a corporation and once they achieve the corporation they immediately go idle and often wind up purged only a few weeks or months later. With Eve corporations not being the easiest things to join the player often puts a lot of time and effort into joining. They fly with the corporation. Do activities. Spend time on coms and work their way into a social group which they then abandon shortly after gaining. It may be disillusionment. The inside and the outside of a place or group can be very different. You can lose interest once you have gained it because what you perceived and what you have are quite different things. But maybe it is the lack of goals. Joining the corporation was a goal. It can be a consumptive goal at that. Once gained you would expect that being in the corporation would be the next goal. What if it is not? What is the accomplishment, consciously or unconsciously, satisfies the person and they lose goals and motivations. Achieving a goal is a wonderful feeling but then what? Or maybe it is just sleep deprived thoughts. I have to change my pillow case thanks to its new coat of orange hair. Hopefully he lets me sleep tonight. I'm going to find out. He's decided when my husband goes out of town that he needs to pretend that he is my cat. And yeah, I totally give fifteen year old kitties more patience then I would younger, healthier ones. We only have them but so long, ya know? I personally find that I am particularly this way with my blog, which is why I am so prone to fits of publishing interspersed with extended silences. I think in EVE we often put a lot of effort into a "push" to do something - a skill to a certain ship, a goal we might set or something we want to write extensively on. At the end, we're exhausted from putting in the extra effort on top of a real life and trying to have fun as well, and have a moment of "the heck with that, I need a break from this - I should go find a fun game to play before I come back to EVE to :DO MORE:"
I find that I am usually active from Pod & Planet - a writing event that demands a lot of thought and creativity and writing and rewriting for a remarkably small number of posts - through CSM elections, a time when I post furiously with long slogs of research followed by an insane volume of writing in a handful of days. After that, I just want to shoot stuff or try a different game for a while. All other goals are transient, specific to a ship or a mode of gameplay. Tur for instance has developed over the years into primarily an Experienced L5 Logi and Light/Fast and Heavy Tackle pilot in Wormhole Ops for PvE&P. I am also interested in EWar and have fairly high game skills there but I am not as skilled in flying as an EWar pilot human terms. Tur is broadly skilled into a wide variety of ships from frigate to BS class primarily focused on Matarii ships. My only Capitol class ships are the Orca and the Fenrir. Tur is a well-rounded PvE/P Wormhole toon but his skills are also all-over-the-place due to Tur being my main and the changes in skilling my changing interests have taken me into over the years. My issue is oddly different. But similar. I've unsubbed and resubbed many times. Normally I quit mid goal. My issue is I set goals like, "Climb Olympus Mons! ", and I only get as far as building my space ship, launching it, piloting it to Mars, and then landing. At the foot of the mountain I just lookup and am too tired to continue. I'll take a month, two months, six months off, and then come back and complete whatever the goal was since I only needed one final push to put me over. Then I'll start a new personal goal too large to possibly be completed and the cycle starts again. It's hard not to love them. "biting the hand the feeds" blog a long time ago talked about player retention and how frustration really was part of retaining your customer base. I personally fought long and hard for fratricide removal from the game. now it's here i find myself strangely unsubbed. It's a mystery to me. I'm sure i'll be back in a few weeks. all the same, there you go. One reason I lasted into my 7th year is I've never had long term goals, just short ones. Mind you, the first was to max my learning skills. Those learning skills almost killed Eve for me before it began. I don't even know how to explain to the majority of the playerbase that once upon a time, if you were smart, you spent a couple months learning how to learn before training anything else. Two months mining, badly, in a Caracal because that's all a lot of us had the SP for, and the old character skill system made a full half of the playerbase Caldari Achura since they by far had the best starting stats. Sorry, you were talking about something and then...Cat. I thought my wife was the odd one for giving a heating pad to creatures that own fur coats. Now, what were you saying?? Oh yeah, the goal achievement thing. I think this exists in RL as much as in EVE. Get that dream job... now what's the next goal? A loss of momentum as much as anything. The trick is not to get lost in the celebration of achievement, find a new goal and start working towards it. 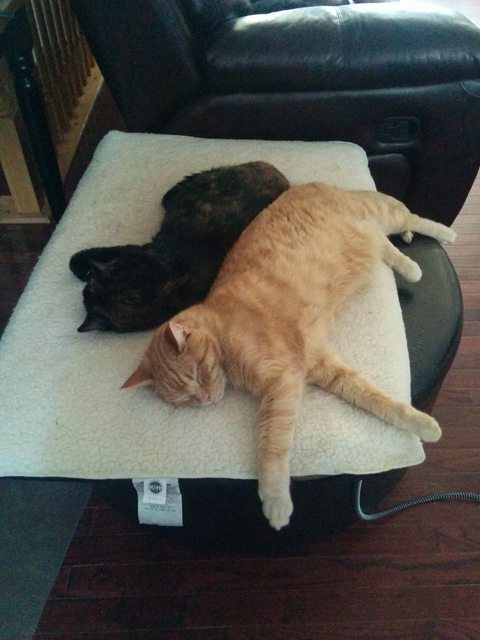 When they were five no such luck on having heated pads. At fifteen as those two are you can see them stretch out and they are more sctive. In general. I'd say that a flagging of interest after a major milestone is normal. In my karate studio I've often hear the instructors sigh about people who go through the trials of earning their first degree black belt and then fade away. To the dedicated martial artist the first degree belt just means the beginning of the "real" path of martial arts - you've learned all the skills, now you have to master them. Perhaps there is an intimidation factor: it's the same as the classic point where you are truly conscious of how your skill level is different from a master. If you're into PVP then as a newbie you might think "I want to solo like Fintarue" and think that's just a week away. Once you've then tried to solo for a month solid you realize the combination of knowledge and skill that it really takes to be anything like the solo artists you see on YouTube or Twitch. Perhaps that's the point where you both hit a new level of capability, and at the same time realize just how much more there is to learn, so perhaps it's natural to congratulate yourself at the same time internally you are disheartened and find yourself stepping away. That poor kitty looks worn out after performing his early morning duties. And what thanks does he get? You'd better hope he doesn't read this blog, missy. Cats were worshiped as gods in Eygpt. They have never forgotten this. You decline a cats beloved attention. Absolutely heathenish. In the interests of full disclosure, I have been the crazy cat person. We currently have 2. At one stage we had 6.